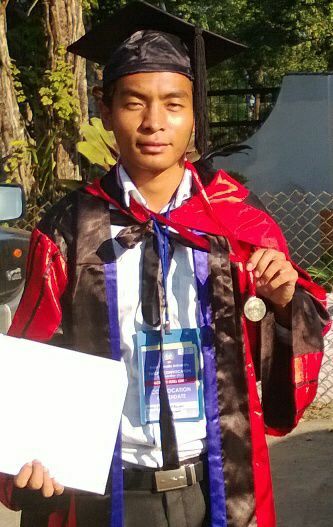 Miao, 1st December: Nepha Wangsa, son of a Touring Catechist from an interior village brings accolades to our Diocese by receiving Gold Medal at the 12th Convocation of Rajiv Gandhi University, Rono Hills, Doimukh, Itanagar, attended by Hon’ble Chief Minister of Arunachal Pradesh, Mr. Nabam Tuki and host of other public and political leaders, for securing the highest mark in Political Science in Arunachal Pradesh during the academic year 2011 – 2012. “The lesson I learned from the Fathers who taught me ‘Do something worth doing’ always rings in my ear,” he concluded. Expressing joy at his son’s achievement, Mr. Wangjam Wangsa the Touring Catechist of Ngissa Parish said, “I cant hide my joy. He has made all of us proud. I hope that his example inspires many tribal boys and girls like him from remote villages like ours to make these ‘unknown’ villages known globally.